There was a time, not so long ago, when nearly every town, large and small, had its own bank. It was a bank where decisions and loans were made locally, where the officers and employees were friends and neighbors. As often as not, that bank was called the First National Bank of Anytown. 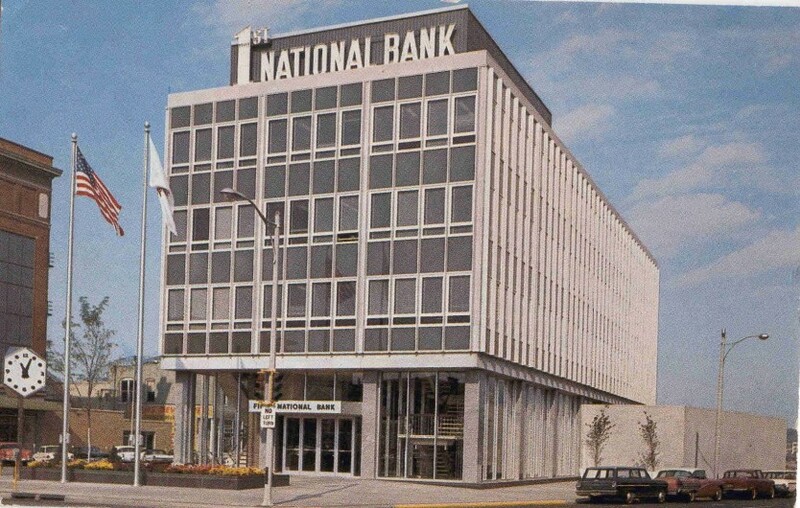 Rock Island, too, had a First National Bank, in fact it had two. The history begins about 1852 with the bank of Cook, Sergeant and Parker. That bank was bought in 1856 by Mitchell and Cable, which became Mitchell and Lynde in 1860. In 1863, Messrs Mitchell and Lynde started a second bank, this time a national one, which they called, appropriately, First National Bank. These two banks merged in 1890 and operated under the Mitchell and Lynde name. In 1905, a new state charter was the impetus for the name change to State Bank. That name endured until the First National Bank name was reinstated in 1946. Although the name changed over the years, the location of these banks did not. They remained in the flatiron shaped block on the north side of Second Avenue at its 17th Street intersection. Today’s photo postcard from Richard Iverson’s collection shows the third bank building on that site. It shows the bank building not long after it was completed and occupied in 1963. In 1961, the bank had moved its operations to the basement of what is now the Ann Goldman building across 17th Street so that the outgrown bank building could be demolished to make way for the postcard building. The old bank, whose demolition was begun on September 26, 1961, was an outstanding 1891 Renaissance Revival structure in its own right. The new bank was designed by the Rock Island architectural firm of Stuhr, Parkhurst & Appier in the International style. Although the International style had its roots in Europe in the 1920s and 1930s, it was not until the 1940s and 1950s that it became popular in America. Some International houses were built – notably Philip Johnson’s Glass House, and Ludwig Mies Van der Rohe’s Farnsworth House, but most International buildings were larger, often multistory apartment or commercial buildings. Comparatively large sheets of glass, sometimes tinted to match their metal frames, can give a shimmering quality – think of the bronze-hued Seagram Building in New York City as an example. Although box-shaped and unadorned, International style buildings are anything but simple. A close examination of the exposed intersections of steel, glass, metal and masonry can reveal exquisite detail and indicates the great skill required to design such a ‘simple’ building. A commonly seen feature of International buildings is a lower story that is partially open on one or more sides, with the overhang supported on stilt-like steel columns. The residential Steepmeadow building on 21st Avenue in Rock Island, designed by the Chicago firm of Skidmore Owings and Merrill is an excellent example of this design. The effect is similar on the First National Bank building, which has upper stories \ cantilevered over the street level rather than being supported at the periphery. Contractor C. H. Langman & Sons had the new bank ready for occupancy on June 29, 1963. The 53,000 square foot bank had four stories plus a basement, with an extended area for five drive-up windows at the rear. The one-story walk-up facility on the east side was added in 1972. At the present time, this is still a bank building, although First National no longer exists. It is now home to Modern Woodmen Bank. Yet it appears the same as it did on this postcard, missing only the rooftop sign. There is still a welcoming mini plaza outside the front entrance, complete with flags atop paired poles. The original large black granite raised planting bed looks like new, except for edges scarred by after-hours skateboarders. Even the iconic geometric clock holds its place. Its three precisely angled hexagonal clock faces make it perfectly designed for this nearly triangular lot. And with its counterpoint clock from the 1891 building mounted on the opposite corner of the bank lot, there is a constant reminder of both our banking and architectural history. This article, by Diane Oestreich, is slightly modified from the original, which appeared in the Rock Island Argus and Moline Dispatch on July 6, 2007.